It’s never easy to share concert news like this. 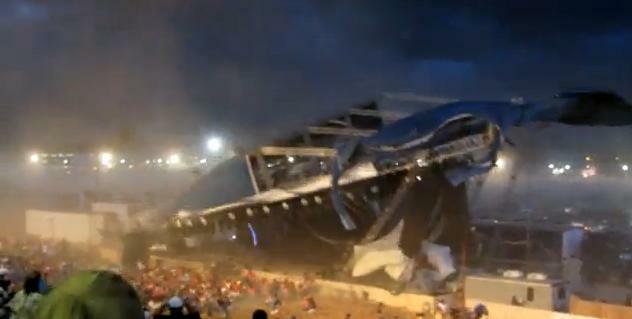 But according to WRTV Indianapolis, on Saturday night before the Sugarland concert at the Indiana State Fair the stage collapsed injuring 45 and killing 5 concert fans. And as the Los Angeles Times, the 5 victims were identified by the Marion County coroner’s office as Tammy Vandam, 42, of Wanatah; Glenn Goodrich, 49, of Indianapolis; Alina Bigjohny, 23, of Fort Wayne; Christina Santiago, 29, of Chicago; and Nathan Byrd, 51, of Indianapolis. “People put themselves in jeopardy…and it’s gratifying to know that at a moment’s notice people will jump in to help others,” said Indiana State Police Sgt. Rich Myers. In the wake of this sad news I also thought about our other tragic concert news about other stages collapsing and concert fan assaults. It’s certainly been one heck of summer for concertgoers in 2011. And when I read Nettles’ response, I thought about our ongoing grief experiments and our previous Sugarland exploration, when we asked two curious questions about their live concert experience. And I can only imagine how such a moment like this Indiana State Fair tragedy will impact future shows for the country duo. Again, we are saddened by this news. And as always, we send our thoughts and prayers to family and friends of everyone involved in this tragic event. And like we’ve done before on Live Fix, we pay tribute to this female fan and other concert fans who have passed on to the big concert venue in the sky. As the fair reopened Monday, investigators and the families of the dead and injured were still seeking answers to hard questions: Was the structure safe? Why were the thousands of fans not evacuated? Could anything have been done to prevent the tragedy? State fair officials have not said whether the stage and rigging were inspected prior to Saturday’s show. Fair spokesman Andy Klotz said initially that the state fire marshal’s office was responsible for inspections, but he backtracked Monday, saying he wasn’t sure whose job it is. Were you at the Indiana State Fair to witness this tragic event? Have you experienced a similar traumatic event at a concert? Do you think about the event when you go to future concerts? We invite you to share your thoughts and ideas in the comments below, so we can discuss and explore them in a future episode of Live Fix Radio.